Nowadays an individual recites the Quran to another, however he does not know it’s meaning! He memorises the Quran, repeats it and he does not know it’s meaning. No understanding, and possibly he does understand, but he doesn’t act (by it). The Quran requires understanding, implementation and action. I saw that and experienced it many times. 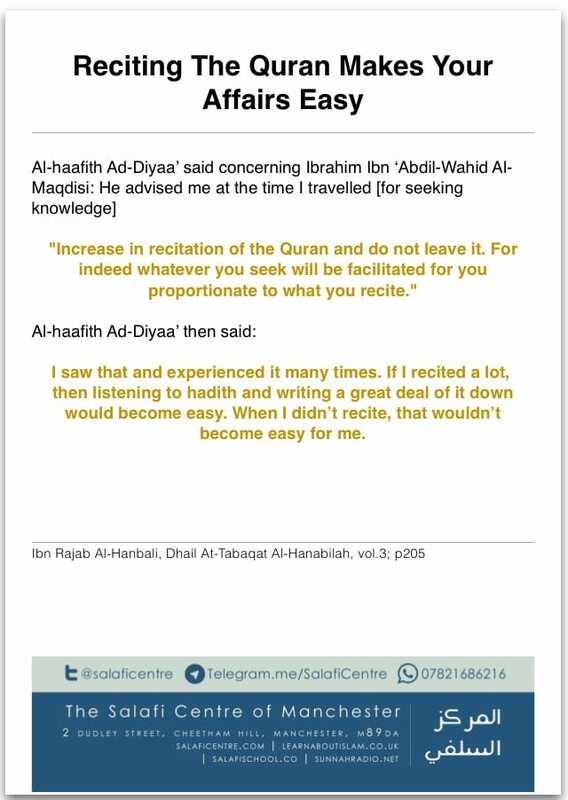 If I recited a lot, then listening to hadith and writing a great deal of it down would become easy. When I didn’t recite, that wouldn’t become easy for me. 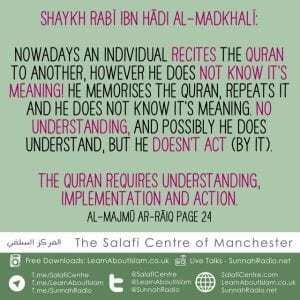 Reciting the Quraan is not merely reading it’s letters, or memorising its verses and chapters; rather indeed the reality of reciting the Quran is reading, understanding and action. 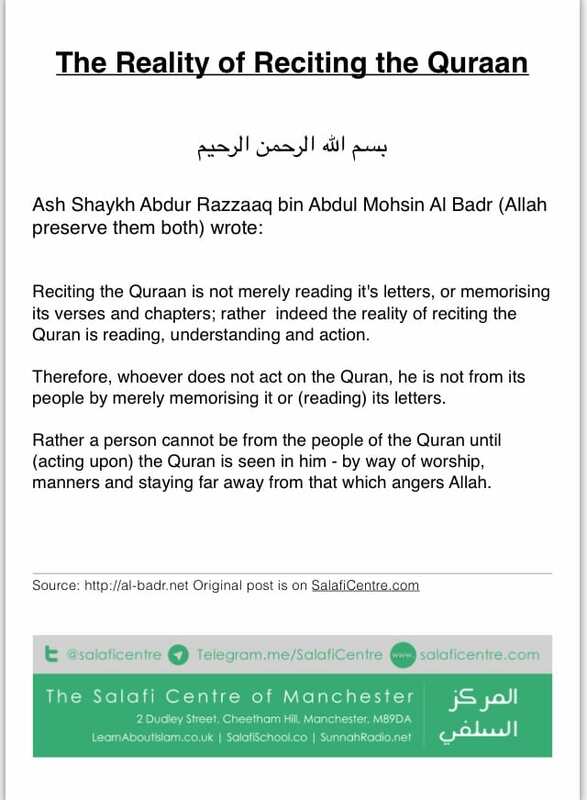 Therefore, whoever does not act on the Quran, he is not from its people by merely memorising it or (reading) its letters. Rather a person cannot be from the people of the Quran until (acting upon) the Quran is seen in him – by way of worship, manners and staying far away from that which angers Allah. 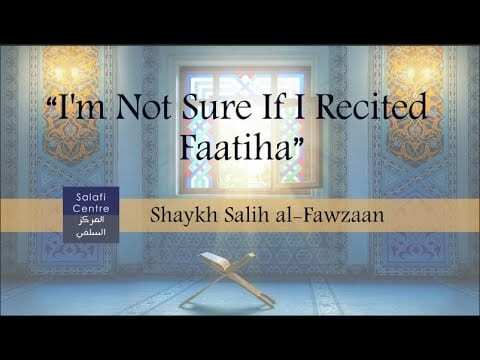 The following question was posed to Shaikh Bin Baz: “Some people get a mus’haf and look into it [reading in the mind] without moving their lips; is it still applicable to term this scenario as “reading the Qur’an”? Or is it a must to pronounce/utter the words and for that to be heard in order to deserve the reward for reading the Qur’an? And is a person rewarded for just looking into a mus’haf [reading in mind]? There is nothing preventing looking into the Qur’an without reading [physically] to ponder and contemplate and understand the meanings, but the one who does this is not considered “a reader” [to have actually ‘read’ the Qur’an] and he does not receive the virtue of actually reading unless he pronounces the words and physically reads the Qur’an, even if those around him cannot hear [i.e. it is not required to be loud, but physical pronunciation required though], due to the statement of the prophet “Read the Qur’an for indeed it will come as an Intercessor for its companions on the Day of Judgement” [Muslim]. The prophet صلى الله عليه و سلم intended by the ‘companions of it’ i.e. those who act upon it, just as it is mentioned in other ahaadith. 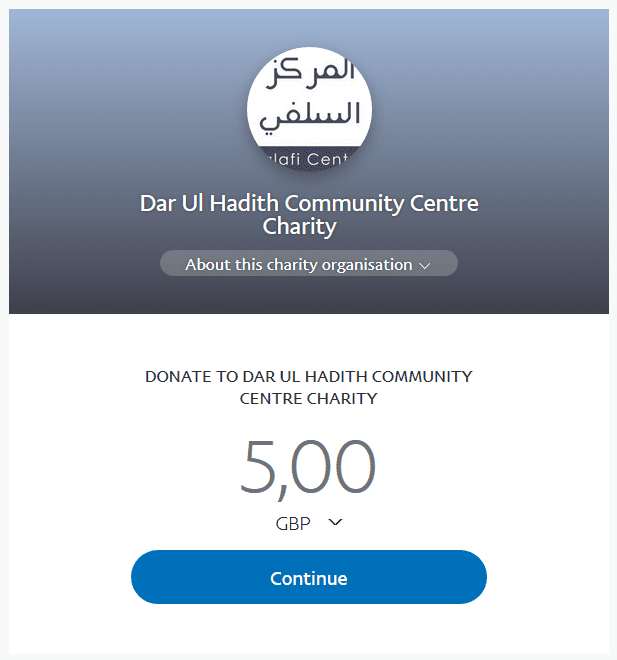 Similarly the prophet صلى الله عليه و سلم said, “Whoever reads a letter of the Qur’an so for him is a reward, and every reward is 10-fold of its example” [at-Tirmidhy & ad-Daarimy with an authentic chain]. And a person is not considered a “reader” unless he utters [and pronounces that reading], just as the people of knowledge have stated that. There is a masjid whose Imaam is a Haafidh of the Qur’aan and he has good understanding in the issues of the prayer, except that there are some defects on his tongue (i.e. in his pronunciation); but he is from a non-Arab country. Is his Imaamship valid alongside the fact that there are those with a clearer tongue than him? I say: (If) he is not able to pronounce the (letters and sentences) of the clear Arabic language, then he may (read) some of the verses with other than its intended (meaning), such as substituting(ر) with a ( غ ) or a (ح) with a (ه )- saying: (الرهمن), which is similar to what some non-Arabs do; saying: الهمد لله and substituting the (ح) with a (ه); [(saying) الهمد لله رب العالمين instead of الحمد لله رب العالمين] or substituting (ر ) with a ( غ) and what is similar to it; then it is not permissible to pray behind such a person, rather he should learn because the meaning of (what he recites) is the opposite. And if his defects do not change the meaning, then there is no harm in praying behind him. (If) his defects changes the meaning, it is obligated on him to rectify his tongue (i.e. his pronunciation) by learning the Arabic language. It is obligatory to get other people to be Imaam if he changes the meaning (in his recitation).